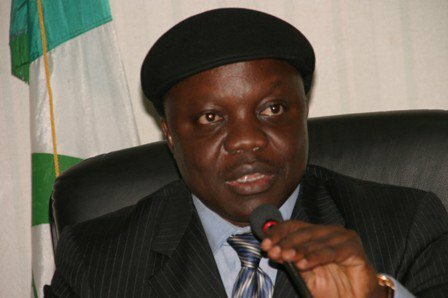 Human Rights Writers Association of Nigeria (HURIWA), has decried what it described as politically motivated group of individuals efforts to tarnish the public standing of ex-Delta State Governor, Dr. Emmanuel Uduaghan, reports ITRealms. The National Coordinator of HURIWA, Comrade Emmanuel Onwubiko alongside the Nigerian Human Rights Queen (2017), Miss Chioma Okoli among other officials, disclosing this at media briefing Tuesday. Onwubiko confirmed to journalists that his organization has been inundated by pressure from some known political blackmailers to be enlisted in a sinister plot to stage street protests to the premises of the Economic and Financial Crimes Commission to attempt to hoodwink the hierarchy of the anti-graft panel to begin systematic witch-hunt of the immediate past administration of Delta State. The Rights group wondered why unscrupulous persons sometimes with powerful political sponsorship will seek to continuously attempt to recruit registered groups that have credibility to do some sinister campaign when legally such organisations can be sued by those politically exposed persons whose well earned good reputation as statesmen/women are being tarnished on the alter of sensational media stories. The Rights group said the ongoing mass demonisation and character assassination of some members of the political class whose political tenures in various offices have remained untainted has created the erroneous impression that all political office holders in Nigeria are corrupt. HURIWA noted that it has become imperative for it to go public with this information so Nigerians would be made aware of the existence of many phantom groups, whose major preoccupation is to stoke the embers of hatred against targeted high profile Nigerians just because such persons may not have agreed to be blackmailed into paying huge pay outs to such professional and career blackmailers. HURIWA, however, warned against the deployment of crude and illegal process of mass hysteria and choreographed media trial to engage in the ongoing crusade to eradicate corruption and economic crimes. Onwubiko said: “We urge officials of EFCC to strive to maintain high professional decorum even as they relentlessly chase after corrupt politicians. “EFCC as an agency set up by law must operate within the ambit of principle of rule of law and abide by all constitutional provisions. “We were approached by some professional political blackmailers from Delta State to make our organization available to be used as a weapon of mass politically motivated battle against the person and character of the former governor of Delta State but we declined on the ground that the allegations against Dr. Emmanuel Uduaghan are not only false but are well orchestrated campaign of calumny meant to prepare the ground for the media trial of the immediate past governor. “We also declined to participate because we know with available records that as the governor of Delta State, Dr. Uduaghan carried out landmark programmes and projects that significantly improved greater respect to the Human Rights of Delta State residents. “The then administration transparently handed over to the current administration. As a credible Civil Society platform that has been on ground for 10 years now, HURIWA meticulously monitored the immediate past administration of Dr. Emmanuel Uduaghan and we can without any fear of contradiction assert that with the evidence at our disposal, those allegations being bandied about are frivolous, unsubstantiated, malicious and lacks credibility. “How on Earth could the former governor have pocketed a whooping N800 billion and was able to consistently pay salaries for eight years and implemented far reaching impactful projects for the people of Delta State? “Our fundamental reason for not making our platform available for media trial of politically exposed persons who we know had discharged their constitutional duties creditably is because the abundance of provisions in the constitution of the Federal Republic of Nigeria of 1999 that frowns against media trial of all persons. HURIWA reasoned that those championing these campaigns of calumny have ulterior motives to railroad the judiciary into passing thoughtful verdicts against their perceived political opponents whenever the anti-graft agency is armtwisted to head to court. It added: “It is our conviction that EFCC will not allow blackmailers to push them into embarking on wild goose chase which will cost taxpayers billions of cash that could have been deployed to provide social services and other democracy dividends. “Judicial independence is essentially composed of two foundations (i.e individual and institutional) that cumulatively ensure the independence of the judiciary. “Independence of the judiciary means that every judge is free to decide matters before him in accordance with his assessment of the facts and his understanding of the law, without any improper influences, inducement, or pressures, direct or indirect, in any quarter or for any reason; and that the judiciary is independent from the executive and legislature, and has jurisdiction directly, or indirectly, or by way of review, over all issues of a judicial nature 15. “See ‘Judicial Independence: the contemporary debate’, Shimon Shetreet and Jules Deschenes eds: 1985.